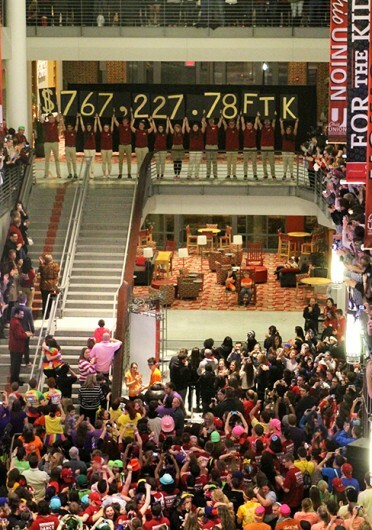 BuckeyeThon participants reveal $767,277.78 was raised for Nationwide Children’s Hospital Feb. 15, during the 24-hour dance marathon Feb. 14 and 15. Some Ohio State students danced and fundraised their way to collecting more than $767,000 for children in need this weekend. Participants in BuckeyeThon raised $767,277.78 for Nationwide Children’s Hospital during the 24-hour dance marathon Friday and Saturday. In its 13th year, the event sponsors children being treated in the Hematology, Oncology and Bone Marrow Transplant Department at Nationwide Children’s Hospital, which is part of the Children’s Miracle Network, according to its website. Suraj Hinduja, president of BuckeyeThon, said he was in disbelief when the amount of money raised was revealed Saturday. “To think that we just exceeded our goal that our members have put their lives, hearts and souls into everything we have just done – that’s what speaks volumes to me,” said Hinduja, a fourth-year in special education. 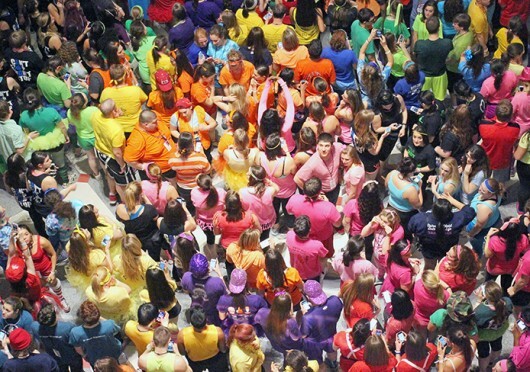 BuckeyeThon consisted of two 12-hour shifts that attracted more than 3,000 participants total at the Ohio Union, according to a BuckeyeThon press release. The first shift was from 8 p.m. Friday to 8 a.m. Saturday, and the second shift started at 11 a.m. Saturday and ended after the final amount raised was revealed at 11 p.m. The founder of BuckeyeThon and an OSU graduate, Rosa Ailabouni, said 140 people attended the first ever BuckeyeThon event in 2001 and $3,200 was raised. “The idea came from wanting to bring the Ohio State community together, and also wanting to bring Ohio State together with the Columbus community,” Ailabouni said. She said Saturday she was in awe of the money raised this year. BuckeyeThon participants raised nearly $159,000 more than the 2013 event, where about $608,600 was collected. Hinduja said he hopes participants can increase the number of donations next year, too. “I have no doubt in my mind that they will continue to break barriers,” Hinduja said. Two other universities also held dance marathons to raise money for hospitals in Children’s Miracle Network over the weekend. University of Connecticut students raised $457,581.04 at HuskyTHON, and Dance Marathon at University of Michigan participants raised $446,399.57. Students had to raise a minimum of $100 to participate. During registration, students have the option to sign up as a team with student organizations they are members of or with their residence halls. Teams are assigned to one of eight colors. OSU students stand with their teams during BuckeyeThon Feb. 15. During registration, students have the option to sign up as a team, and teams are assigned to one of eight colors. Each team supports children like Josh Wade, who has overcome a birth defect to his intestinal tract with multiple surgeries. Josh has attended BuckeyeThon the past five years with his mother Lisa, and said he wants to go to OSU when he is older. Students sported tutus, fanny packs and other mono-colored outfits as they continued to raise money up until an hour before the final reveal. Adam Pemberton, a third-year in marketing, was on the Mack and Canfield residence hall team and said this was his first BuckeyeThon. This year’s BuckeyeThon wasn’t the first for students like Katelyn Kraft, a second-year in early childhood education. BuckeyeThon had different activities to keep participants’ energy up including Zumba, hair cutting for donation and Olympic-themed games. The Aveda Institute gave free haircuts for those who wished to donate their locks. Participants could have anywhere from 3 to 12 inches of hair cut off, which was then donated to Locks of Love and Wigs for Kids. Hannah Jones, a second-year in social work, donated 8 inches of hair. Hinduja said the planning for this year’s event started a week after BuckeyeThon 2013.